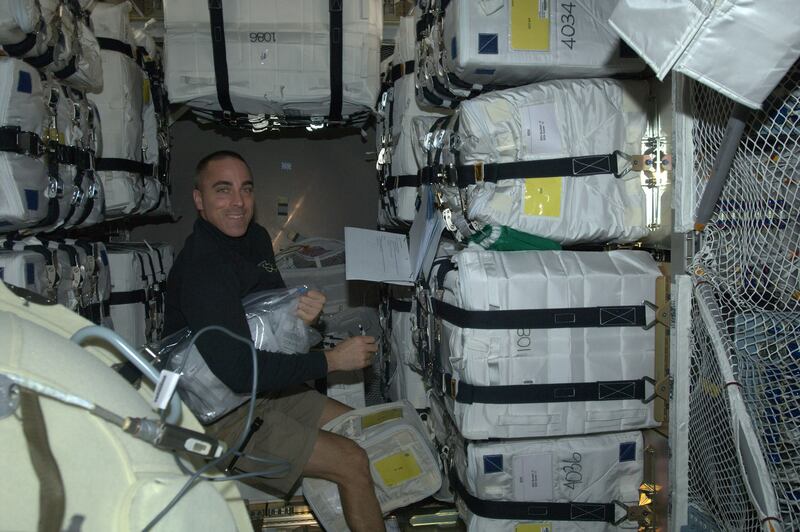 The arrival of ATV-4 has changed the pace of life that I’d gotten used to, because transferring cargo is now one of our highest priority activities, especially for certain ‘payloads’ (they’re called ‘payloads’ because they are paid cargo, as opposed to logistical cargo). So from the moment the hatch was open, I set to work transferring a pump for the Columbus cooling system that I’ll install as soon as I can. From then on, as a loadmaster, I’ve been trying to track the cargo movements, which are all coordinated and choreographed on Earth – even those done by my colleagues. Everything has to be removed from the ATV in a precise order. 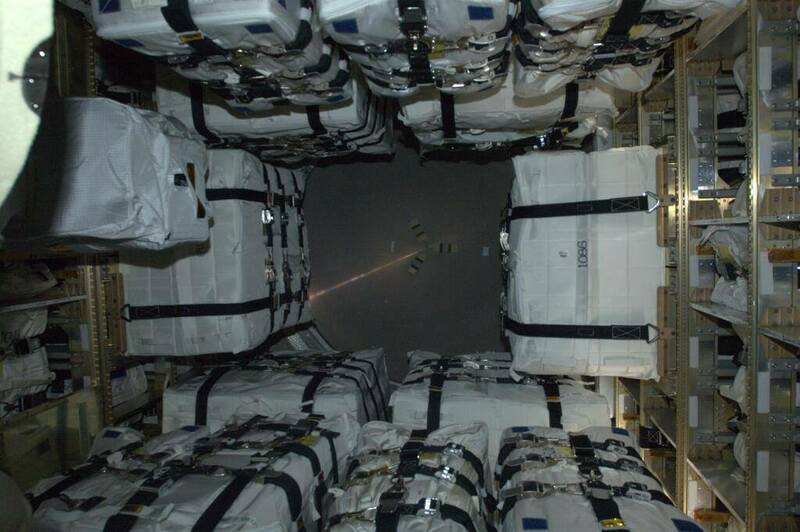 It is catalogued, then installed in its final location inside the ISS. At the same time, we have to transport all waste materials from the station to the spacecraft – all without changing the CG (centre of the application of force) too much. We don’t spend all day transferring cargo (although we’d love to finish the task as soon as possible) because the “real” work on board must continue. In fact, over this past week we’ve continued to follow existing experiments and we’ve also set up some new ones. One of the most important experiments that we are carrying out right now is called “spinal ultrasound”. It studies the changes in the structure of the spine caused by weightlessness. 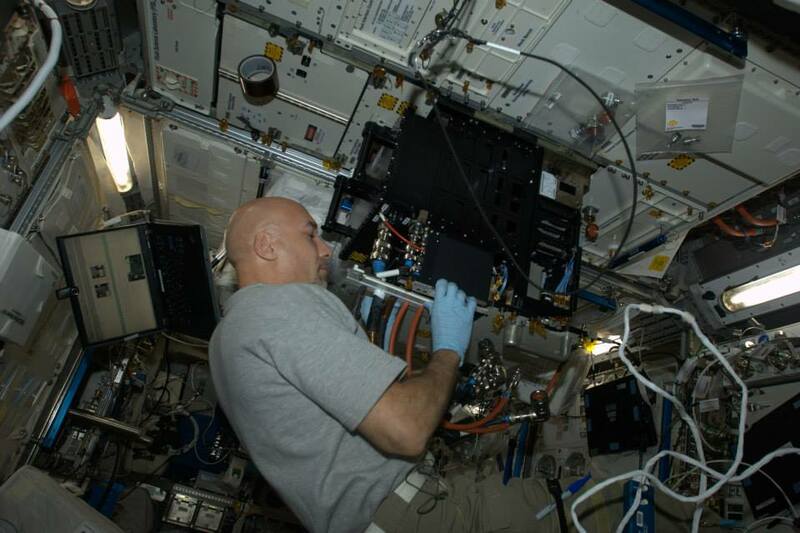 This entails having an astronaut – in this case, me – using an ultrasound machine to obtain images of another astronaut’s vertebral column (in this case, Karen’s) guided by a ground operator on the radio. The images we take are then evaluated and studied on the ground, and compared with images taken before the flight. This study is important and innovative for many reasons: for astronauts, changes in the structure of our bodies could have catastrophic consequences back on Earth. If we understand what these changes are, we’ll be better able to combat the negative effects or, better still, to prevent them. But the terrestrial implications are even more important: up until now, we’ve needed expensive and bulky magnetic resonance or X-ray machines to carry out any diagnosis of the spine. These studies mean it will now be possible to obtain comparable results using an ultrasound machine the size of a portable computer, and for a much lower cost. Together with studies on remotely controlled operations, this technology will allow doctors to carry out diagnoses in inaccessible places or in very poor areas where people have no access to the current diagnostic tools. I’m also working on an experiment called Pro-K. This is a diet completely controlled from Earth that focuses on the relationship between animal protein (Pro) and potassium (K). The study aims to show that this special diet can help reduce the loss of calcium from bones, which is one of the side effects of weightlessness. Again, even though the results of this research are important for us astronauts, they also have applications on Earth: millions of people who suffer from osteoporosis could benefit from the findings. I have been directly involved in another experiment that came on board ATV-4. It’s called FASES and it examines emulsion stability. This is an all-European experiment – which is really great. It involves studying the various phases of different emulsions, some more stable, others less so. Emulsions are present everywhere in everyday life, from the chemical industry (e.g. for crude oil and other fuels) to the kitchen (mayonnaise and vinaigrettes are both emulsions). We need to understand the characteristics of emulsions because sometimes it is useful to increase their stability (when storing food or fuel) or decrease it (when extracting fuel). This experiment was really complicated to set up and even though I’d practised it on the ground, doing it in orbit was completely different. Once again, the problems I encountered were the opposite of those I had during training. The “rack” (the laboratory) where I set up the experiment is very delicate and complex, and I had to use a lot of different tools. Right in the middle of setting it up, the container system I was using (a re-sealable plastic bag like a Ziploc) opened up and sent lots of tools flying around in cloud of metal – half of the Columbus turned into some sort of nightmare Ikea project! Next week will begin with my Russian colleagues’ extravehicular activity (EVA), when I’ll be involved in closing the hatch and checking the airlock. Then there’ll be more experiments, and I’ll also start preparing for my EVA. Ciao Luca, non vedo l’ora di seguire online la tua prima EVA! I’m sure there will be live streaming. Ciao! Very nice blog. I hope the K & protein experiment results are statistically significant and positive. That would be helpful on earth especially for bone loss in women on earth as well as in space. I did not realize the importance of CG in packing the ATV. Glad you survived the tool episode. Thank you for sharing your experiences. Yeah, the tool episode could have been a disaster 🙂 I barely survived! Now when I think about it i want to laugh. Absolutely Amazing Reading … I hope some of the critics of ISS and Space Programs read that Article: So they can see how We On Earth Benefit from the Research and Experiments that are carried out on ISS. How was it decided who would do the spine ultrasound, and whom it would be done on? Or do you eventually all take turns? We are presented with different experiments while training, and we can volunteer. Then, according to the planning and individual characteristics, we are assigned. I volunteered for all of them 🙂 Here on the ISS, for the spinal ultrasound, we’re all “operators”, and Karen and I are also “subjects”. Ti seguiremo con orgoglio e ammirazione. Grande Luca. Scusaci per il Tu! io preferisco il tu (almeno su internet! 🙂 e vi ringrazio delle belle parole. ecco un tipo di lavoro di cui non sapevo assolutamente niente. grazie per le informazioni e per gli esperimenti che conduci per la nostra salute….e per le foto bellissime!! penso che uno dei lati negativi possa essere la solitudine, magari studiate anche questo. comunque, se hai voglia di dire due “bischerate”, noi ci siamo!!! buon lavoro! ecco un tipo di lavoro di cui non sapevo assolutamente niente. grazie per le informazioni e per gli esperimenti che conduci per la nostra salute….e per le foto bellissime!! penso che uno dei lati negativi possa essere la solitudine, magari studiate anche questo. comunque, se hai voglia di dire due bischerate, noi ci siamo!!! buon lavoro! Ma di bischerate ne dico tante, mica due :). Per adesso non ho scoperto nessun aspetto negativo, e la solitudine non e` applicabile, qui sono sempre in compagnia!